I have been putting this post off. It seemed it would be one of those “do as I say, not as I do” scenarios. I have also received the full brunt of people’s opinions on the matter and I guess I’m dreading adding to that by posting this. 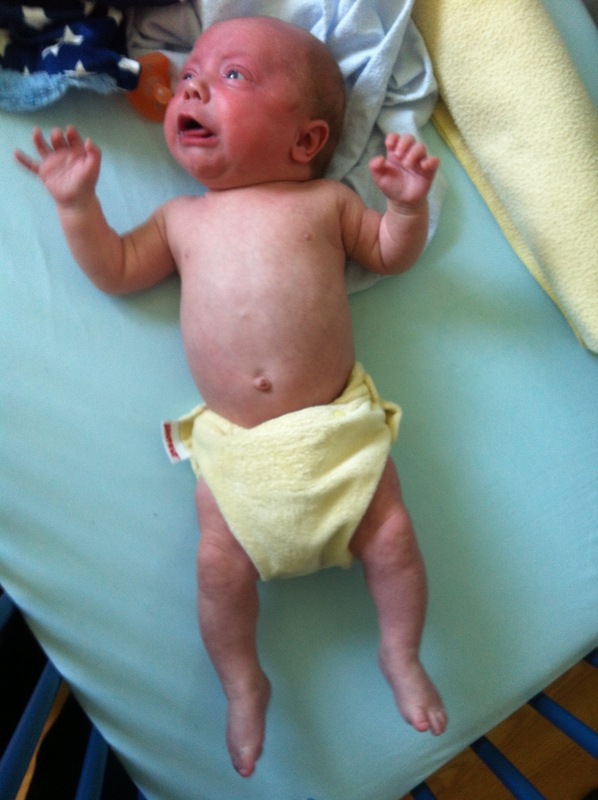 If they make cloth diapers for preemies, we certainly couldn’t find them around here. 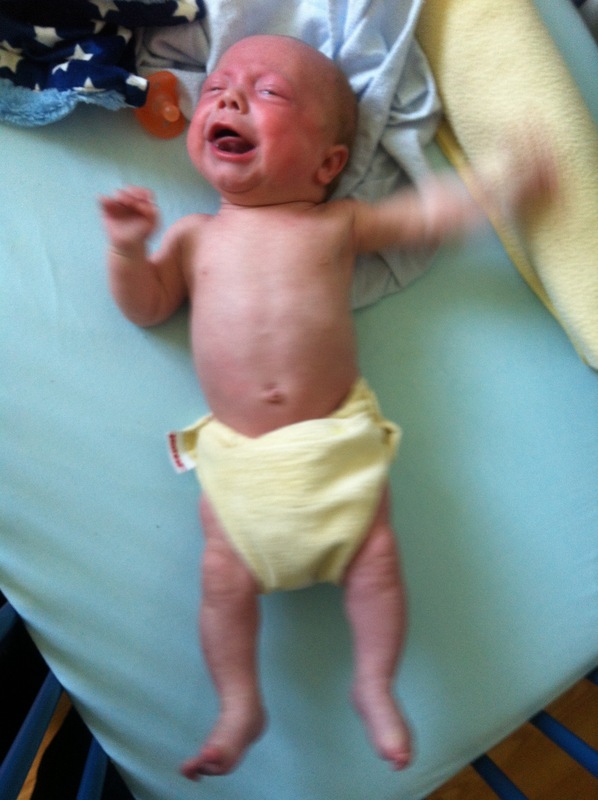 The beautiful soft cloth diapers were bulky, hot and hard to move around in. He got frustrated and so did we. If at this point you’re rolling your eyes, stick with me. There is a light at the end of this tunnel. Desperately wanting to bring Quentin’s diapering more in line with our Montessori values, we got a potty for him, and placed it in the bathroom when he was 8 months. This was only to have him see it. The Montessori pedagogy states that a child passes through the Sensitive Period for Toileting between 12 & 18 months old. We wanted to have him used to seeing the potty by then. We made no reference to it other than to casually say “Potty. That’s Quentin’s potty.” whenever we were in the bathroom with him for baths or while we brushed our teeth. At 9 months we began Quentin sitting on the potty. Again it was not to do anything. Just to sit while we were in the bathroom. Following the child, we helped him off as soon as he did not want to be there, and we never left him there for an extended period of time. He would occasionally pee. It was more of a coincidence than anything. At 10 months we set up his “Care of Self” area in the bathroom. I made the small shelf out of 1/2 metre of trim, some pretty scrapbook paper and a cereal box back. I ordered some pretty laminated fabric with a red that matched the potty (because yes, I’m that person) and made a little waterproof pad. We have the worlds smallest bathroom. We needed something that worked without getting in the way. The shelf holds Quentin’s tooth brush, comb and soap with dish nicely. We started really observing Quentin’s toileting routine. We started taking him to sit on the potty after every meal, before leaving the house, coming back to the house and before bed. Each time, we asked him “would you like to pee?” and only kept him there until he wanted to go. If he protested, we would not take him then and try later. At 12 months we decided that we were far enough along to progress to underwear at home. We searched everywhere for something that would fit him. I had wanted to try “Under the Nile” since I had read good reviews from other Montessori families. I ordered their smallest size (12 month) but Quentin is in (still!) 3-6 month clothes. They were just too big and not going to work. I scoured the web and came across these. I sent off Quentin’s measurements and she made them for me. They are perfect. At 14 months (12 1/2 corrected age) Quentin has been successful in staying dry all day (including naps) for the past 3 days. We continue to take him, and he lets us know by yelling if we’ve left it too long. We’re trying to add the ASL sign for toilet to his repertoire of signs. He takes pride in “going,” saying “I did it” and flushing the toilet after I empty the potty. We (here comes my disclaimer) have never used rewards of any kind, nor punishments for Quentin. When he has an accident, we will ask “Did you pee in your underwear?” He will usually answer with his noise for yes. Then we walk him to the bathroom and help him get into clean clothes and wipe up any mess. We never shame or scold him. Just carry on with our day. I’ve ordered this to complete his “Care of Self” area. I had no idea these existed until I saw it Pinned. It attaches to the bathtub. The perfect height. I never expected the backlash on the topic. From complete strangers but also sadly from family. “Really cracking the whip” is a mild example. “Oh! Well! You do Montessori (accompanied by an eye roll) is more hurtful. The list goes on. We are not completely delusional. We know there will be accidents, and we have chosen to wait a little before trying “diaper less nights”. 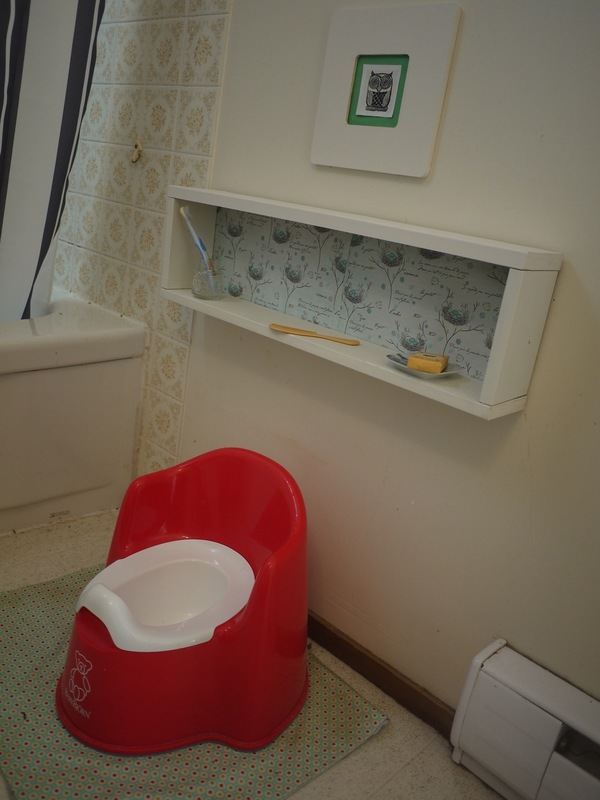 Montessori’s definition of Toilet Learning is that the child learns to recognize and control his/her elimination. Not just dry pants. There is not so much a start, although maybe at birth, and not so much an end as there is a progressing in aptitude. It may not be the right way for everyone, and I know that it definitely is not a strictly Montessori way, but it is the way our family has done it. We just “Followed the Child”. Hey, maybe not so far off the Montessori path after all. Interesting post – I tried a few months ago but it wasn’t the right time for me (difficult pregnancy) now she is 20 months and definitely ready but I am not sure how to go about it…We have mostly carpet in the house which doesn’t help but I would like to do it this summer…it should be easier1 Any more tips? If Sixtine is showing signs of readiness, I would try to slowly start with those signs. Don’t be discouraged by how slow it is. We were in one stage for 4 weeks before moving on to the next. In the beginning Quentin only sat with his clothes on. He had no interest in “trying to go”. My biggest piece of advice, is don’t set a timeline (you’ll never reach it), keep it realistic (only try at optimum times) and keep it real. We only had a potty in a bathroom (the actual place we “go”). We never had toys or any other entertainment near the potty although sometimes we would sing a song. We let him see all of us use the toilet. he never actually went completely naked. He always felt the sensation of wetting his pants. In the end we let him think that he was in complete control of the situation, which of course he was. I tried to keep in mind that this is his victory. He is mastering control of his body. It’s all on his terms. 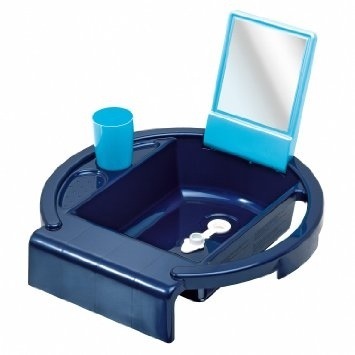 The name of the little sink is “Rotho Child Kiddy Wash”. We ordered it from Amazon.uk. Unfortunately I could not find it anywhere else, but it was reasonably priced and was delivered extremely quickly. Considering he uses it many times a day, it was worth every penny not to have to help him up a tall step stool to our bathroom sink. A quick word of caution: it fits a specific width of bathtub rim. I was able to make a base for it using plastic pipe, so it would fit, however others may not want to do that. All in all though it is excellent. Beth, Great post, thanks for sharing and inspiring other parents to guide their children towards independence. Where can I find the self care unit that clips onto the bathtub? Is it available in the US? The potty should be as near to him as possible to make getting there and using it a success. If you are downstairs most of the day set up a portable Care of Self area in a private corner. This would include a potty, dry underwear/trainers, cloths/wipes, a garbage and a laundry basket. If there is space, ideally you would also have one upstairs in the actual bathroom, where you could set up a proper Care of Self Station. This would include everything he needs to have a bath, wash his face, brush his teeth etc. as well as toilet learning essentials. Thanks so much for this post! It is so beautiful to see how you’ve followed your child! We have also been doing something similar to what you outline here.. just because it is what made sense for our baby. That tub sink is brilliant — I had not seen it before. Amazon seems sold out, so if anyone else knows where to get one, please let me know! In case it is useful to you/others in the future, I have found the best tiny underwear (and tiny trainers) here ( http://bit.ly/2n0wS0q ). They even come in 6 month size!